Last night, in an attempt to keep up with the Fed and ECB, the Bank of Japan announced an increase in their monetary stimulus programs, and the yen reacted accordingly. The "race to zero," as countries devalue their currencies against each other so that they don't end up priced out of the world economy, is a spectacle to behold. Somewhere down the road, it seems there will be an ugly endgame here, but these things can go on for much, much longer than seems reasonable. I remember I felt the same way about the housing bubble back in 2005. I felt quite certain by mid-2005 that things would end very ugly, but housing just kept ramping higher anyway. Eventually, of course, it did end ugly... but it first ran much farther than I thought it would. Most know the old John Maynard Keynes quote: "The market can remain irrational longer than you can stay solvent. My personal twist on that is: "The market can remain insolvent longer than you can stay rational." In any case, no matter what the endgame looks like (and who really knows what that will be), things can always keep plugging along in the meantime. Bears are hoping for a turnaround here, and I've heard a lot of bearish theories floated recently -- on everything from "QE3 is out now, so there's nothing more to fuel speculation and drive stocks higher" to "bullish sentiment is too high." I'll admit, the contrarian (and the long-term bear) in me wants to jump on that bandwagon. But there is the issue of central bank liquidity, and since everyone who has access to an inkjet is printing more money, it's hard to imagine that liquidity won't find its way into equities. I haven't completely capitulated the bear case just yet, because the ending diagonal pattern I've been outlining would look really good with a whipsaw here, and oil has suddenly started diving lower. But it seems the bulls have to be given the benefit of the doubt unless the bears can demonstrate some level of equities selling pressure. The approach I'm taking is basically, "Let's stay aware of the bear argument and watch the signals, but right now the trend is still up." 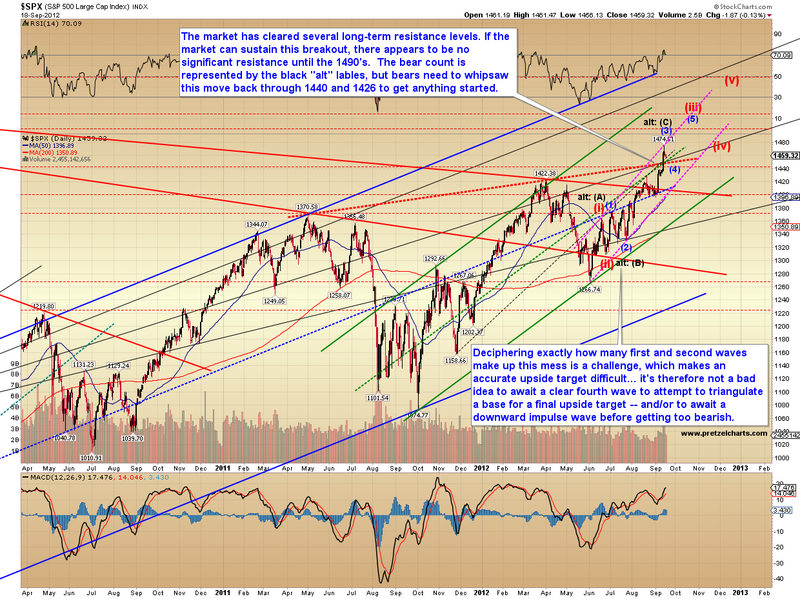 The market is over-bought, and a correction would be reasonable -- yet the momentum which got us here was strong -- and that suggests there are still higher prices coming, either before or after any corrections. I want to lead off with IBM (stock symbol: XYZ. I'm kidding... it's "IBM. "), more for educational purposes than anything. This chart demonstrates RSI and MACD confirmation vs. divergences, which is an aspect of what I'm discussing above regarding momentum. I haven't marked every single instance, but you'll get the idea. 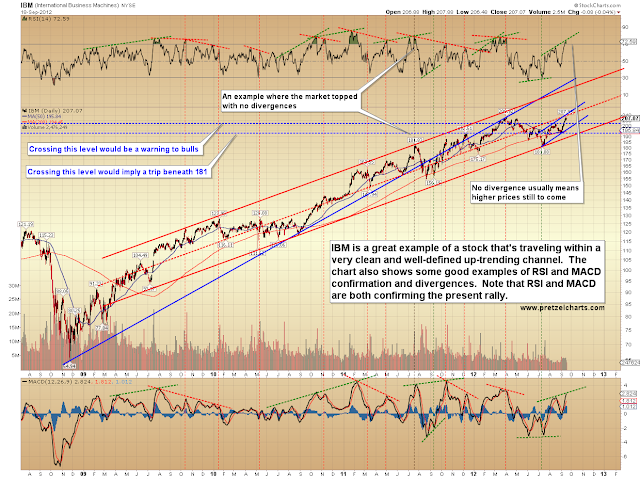 IBM and the S&P 500 (SPX) are both showing confirmation of the rally. While there are always instances when the market turns on a dime, that isn't the rule -- so it has to be considered as lower probability. 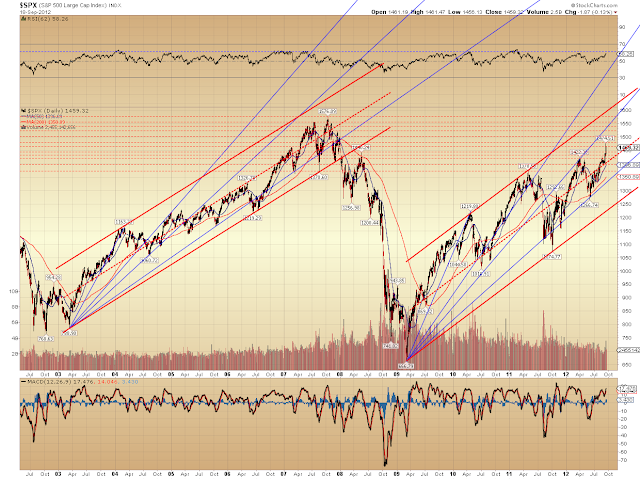 Next are two looks at the daily chart of SPX. On the chart below, the blue annotation in the lower right explains my basic thinking at this point. Back above 1474, and it's likely the market will head to next resistance in the 1490's. On the bear side, the dashed rising red trendline represents the upper boundary of the ending diagonal, and that zone would be the first area for bears to reclaim to be taken more seriously. Finally, a speculative count that I published on the Russell 2000 (RUT) several months ago. One observation which has to be noted is that the rally off the October low was apparently three waves, which doesn't fit into a long-term bull scenario very well (except for the hyper-inflationary option mentioned). 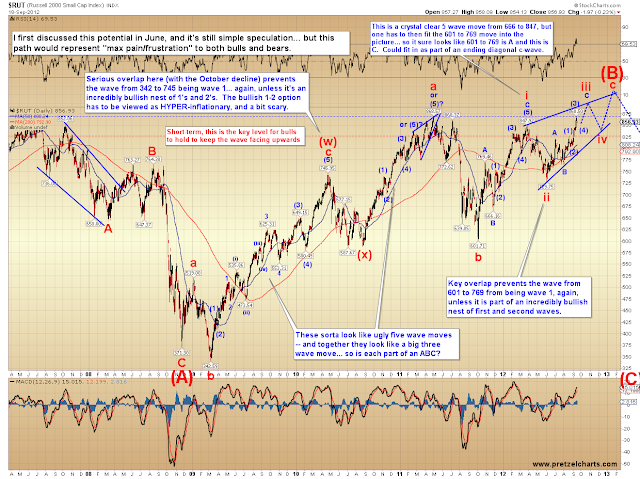 That three-wave rally only fits into certain patterns, and one of those patterns is outlined below. Keep in mind this is just speculation based on the available elements currently present in the waveform. It also satisfies the instincts of the contrarian in me that a straight shot up from here would be "too easy" for bulls. Hopefully this chart doesn't confuse the issue -- consider it a "bonus chart." Like I said, it's just a spec count. In conclusion, while I'm somewhat cautious here, given the lack of divergences, we probably have to continue giving bulls the benefit of the doubt until proven otherwise. I view the short-term as a toss-up at the moment, so I'll publish more concrete targets as they become available. Trade safe.